The plant-based beverages market was valued at USD 11.16 billion 2017 and projected to reach USD 19.67 billion by 2023, growing at a CAGR of 12.0% during the forecast period. The market for plant-based beverages is driven by factors such as the increased demand for vegan food options, amidst the growing health concerns about the consumption of animal-based diets. Apart from this, consumers in emerging countries are adopting hectic lifestyles, which urge them to look out for low-calorie food options with high nutritional value. This has boosted sale of plant-based beverage products. Asia Pacific dominated the global plant-based beverages market. 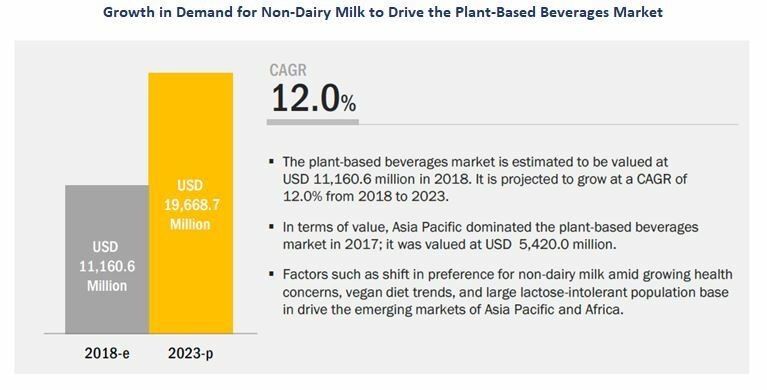 The Asia Pacific market accounted for the largest share in the plant-based beverages market, in terms of value, in 2017. The region consists of key revenue pockets in countries such as China & Thailand, which are some of the key consumers of plant-based diet products. China is one of the largest consumers of soy milk, which is considered the most suitable alternative to dairy milk. Furthermore, the country’s leading dairy products manufacturer, Want Want China Holdings Limited, is expanding its base in the plant-based beverages space. This report includes a study of marketing and development strategies, along with the product portfolios of leading companies. It includes the profiles of leading companies such as The WhiteWave Foods Company (US), Blue Diamond Growers (US), Pacific Foods (US), Hain Celestial (US), SunOpta (Canada), Want Want China Holdings Limited (China), Kikkoman(Japan), Califia Farms (US), The Coca-Cola Company (US), Ripple Foods (US), WildWood Organic (US), and Pureharvest (Australia).